Looking at the 2015 Robert B. Lewis Stakes; Casey’s Picks: Previously the Santa Catalina Stakes, the Robert B. Lewis was renamed in 2007. 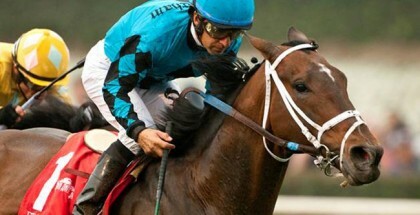 The race has been a great springboard for California-based horses to make it to Kentucky. In the last five years the Robert B. Lewis does have a Kentucky Derby winner to its credit. In 2011, I’ll Have Another used the race to springboard to the Santa Anita Derby win before winning both the Kentucky Derby and Preakness Stakes. Pioneerof the Nile also used the race as a Kentucky Derby prep, which he finished second in. Other horses, such as champions Ferdinand, Artax, and Declan’s Moon has also won the race. The 2015 edition on Saturday, February 7th may be a smaller field, but is power packed and the fans are looking forward to a rematch between the undefeated Dortmund and Firing Line, who finished a whisker back in second in the Los Alamitos Futurity. With Dortmund on the outside, could this be his time to lose? If so, who can beat him? Tizcano (Tiznow – Westerly Breeze, by Gone West) – in his only start this year, this bay colt by Tiznow finished an uneventful fifth in the listed Spectacular Bid Stakes at Gulfstream. In his stakes starts, Tizcano could only muster up a third in the Juvenile Turf Sprint Stakes at Santa Anita last fall. If this colt is going to win here, he is going to have to bring his A+++ game and that may not be enough to beat the talented field here. Rock Shandy (Lemon Drop Kid – Panthera, by Storm Cat) – In his first try on dirt, this son of Lemon Drop Kid did not disappoint. He finished second the Sham Stakes to the talented Calculator, who is connected to the key California three-year-olds, American Pharoah and Texas Red. Before that, he finished a very good second in the Cecil B. DeMille Stakes on the Turf. His pedigree suggests dirt may be his calling, but could likely take to any surface. Look for him to be making his bid on the turn. Sebastian’s Heart (Broken Vow – Dutchess Alexandra, by Judge Smells) – After some decent showings on the dirt, and even a runner up performance in the Speakeasy Stakes, won by Lord Nelson, Sebastian’s Heart tried turf and proved that he did not want any part of it, finishing an unthreatening 8th. Back on dirt and stretching out, he may be a factor since he is a mid-pack runner, but I don’t see him beating the likes of Firing Line and Dortmund. Hero Ten All (Rock Hard Ten – Silky Smooth, by Mr. Greeley) – With a pedigree that may take better to the turf, trainer Jeff Mullins thinks this colt can come back from his 6th place finish in the Sham Stakes. While Calculator is out, Rock Shandy, Firing Line, and Dortmund are here and ready for battle. His workouts are not impressive in the slightest and I don’t see him winning this. Firing Line (Line of David – Sister Girl Blues, by Hold For Gold) – From the first crop of Line of David, this colt only has his maiden win to his credit after barely missing the G1 Los Alamitos Futurity to Dortmund in December. This colt will likely relish the 8.5F distance and could easily get the jump if Dortmund doesn’t kick into gear quick enough. I think this one is the most likely to defeat Dortmund, but can he? Dortmund (Big Brown – Our Josephina, by Tale of the Cat) – Dortmund is the early Derby favorite as of right now, and is hoping to extend his win streak to four in a row. His pedigree suggests that this distance is just right for him and he could possibly win this race easily. 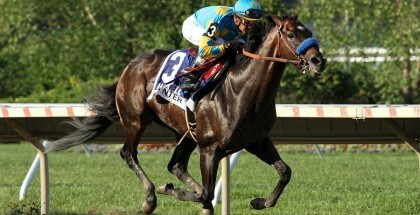 His works have been more than stellar and Bob Baffert and Kaleem Shah are on a roll with their horses lately. I like his chances here, but he needs to kick it into gear before the field jumps out of his reach. Casey’s Opinions: I really like Firing Line here. I think his pedigree is more precocious and geared toward the 8.5F distance. His workouts have been geared more toward building his stamina but I do believe he could possibly end Dortmund’s win streak. 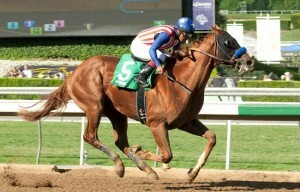 Dortmund is the likely favorite for this race, coming in undefeated for his first start of the season. He needs to be able to kick it into gear a bit better and get to work sooner so he doesn’t have to win a head bob again. Rock Shandy is likely to improve off his Sham runner-up performance and his pedigree looks like dirt could be his preferred surface. I like his chances here.